The shoulders of this splendid antique style engagement ring mounting are draped with rows of glittering round diamonds. 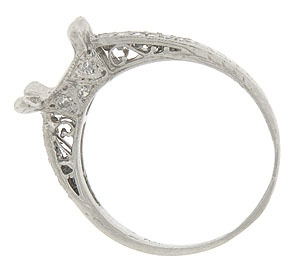 A romantic filigree studded with diamonds covers the rings sides. 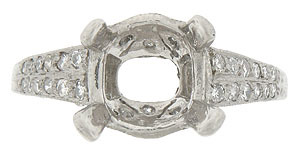 This lovely mounting will hold a 10.6 - 11.0 mm or 4.25 - 4.65 carat round stone. 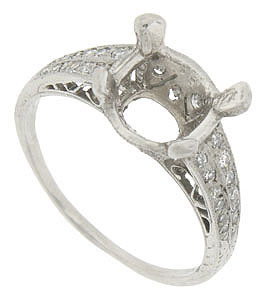 The ring measures 8.99 mm in width. Size 8. We can re-size or reorder in other sizes. Can also be ordered in 14K or 18K white and yellow gold. Actual prices depend on current market value of the precious metal used.